Ingredients: aqua, cetyl alcohol, stearyl alcohol, aloe barbadensis (aloe) leaf juice, helianthus annus (sunflower) seed oil, hydrolyzed rice protein, sorbitan sesquicaprylate, amodimethicone, moringa pterygosperma seed extract, euterpe oleracea (açaí) fruit oil, passiflora edulis (passionfruit) seed oil, oriza sativa rice bran oil, cocos nucifera (coconut) oil, caprylic/ capric triglyceride, panthenol (vitamin b), citric acid, brassica oleracea (kale) extract, simmondsia chinensis (jojoba) seed oil, olea europaea (olive) fruit oil, arginine (amino acid), tocopherols (vitamin e), ethyl hexyl glycerin, sodium benzoate, potassium sorbate, parfum (all natural), rubus idaeus (raspberry) fruit extract, chamomilla recutita matricaria extract, gardenia tahitensis flower extract (monoi). This did absolutely nothing for me. I do have dry hair and hoped this would help. I used well over half the bottle before simply giving up and mixing it with another conditioner. I does have a nice smell but that's all it has going for it in my opinion. Easy to apply! Love it! My one and only that I use. Works amazing, smells great and would never change it!!!! Didn't love it for my curly hair, but it has a very nice scent and it does feel nice on the hair, however my curls were less curly than they usually are. That's the only reason for my 3 star rating. Im sure it would be excellent otherwise. 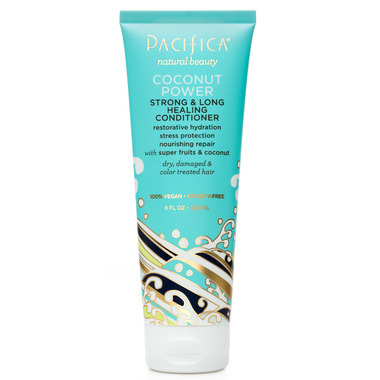 This is a very light conditioner as one of the previous reviewers mentioned. This helps to not weigh hair down, but it's not the best at detangling if you have fine tangly hair like mine. The scent is nice. The coconut smell is not too sweet. My hair is shinier and looks healthier since using this conditionner with the shampoo (I have dry color processed hair). It is hydrating but it keeps volume and doesn't bring down my curls. I find this to be a very light conditioner. The scent is nice, not too strong.